[118 Pages Report] Acetonitrile Market size was valued at USD 209.1 Million in 2016 and projected to reach USD 277.1 Million by 2022, at a CAGR of 4.8% during the forecast period. Among applications, the pharmaceutical segment is expected to lead the acetonitrile market during the forecast period, in terms of value. Based on type, the derivative segment of the acetonitrile market is projected to grow at the highest CAGR between 2017 to 2022, in terms of value. The Asia Pacific region is the largest consumer of acetonitrile across the globe. In terms of value, the Asia Pacific acetonitrile market is projected to grow at the highest CAGR during the forecast period. Increasing use of acetonitrile in pharmaceutical and analytical industry applications is driving the growth of the acetonitrile market across the globe. The value chain of the acetonitrile market includes raw material suppliers and service providers. INEOS AG (Switzerland), Asahi Kasei Corporation (Japan), Nova Molecular Technologies (US), Formosa Plastics Corporation (Taiwan), Avantor Performance Materials LLC (US), and Imperial Chemical Corporation (Taiwan) are some of the leading companies operating in the acetonitrile market. Scope of the report: This research report categorizes the acetonitrile market based on type, application, and region. The report forecasts revenues of leading companies operating in the acetonitrile market as well as analyzes trends in various submarkets. 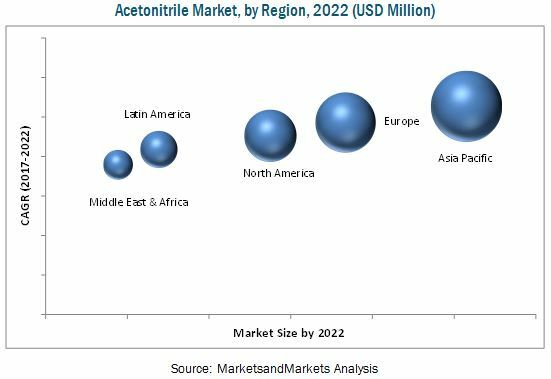 The acetonitrile market is estimated to be USD 219.2 Million in 2017 and is projected to reach USD 277.1 Million by 2022, at a CAGR of 4.8% from 2017 to 2022. Flourishing pharmaceutical industry across the globe, along with increased use of acetonitrile in the analytical industry is expected to drive the growth of the acetonitrile market during the forecast period. Based on type, the acetonitrile market has been classified into derivative and solvent. Acetonitrile is an excellent polar aprotic solvent, which has the ability to attract electrons towards itself. As a solvent, it is used for polymer spinning and casting, DNA synthesis and peptide sequencing, and non-aqueous titrations. Acetonitrile is also used as a stabilizer for chlorinated solvents and is used for the purification of wool resins. Based on application, the acetonitrile market has been classified into pharmaceutical, analytical industry, agrochemical, extraction, and others. The pharmaceutical application segment of the acetonitrile market is projected to grow at the highest CAGR during the forecast period, in terms of value. The growth of this segment of the market can be attributed to the increased demand for recrystallization of drugs from the pharmaceutical industry. The Asia Pacific region is the largest market for acetonitrile across the globe. Continuously increasing population and growing number of end-use industries in the region have also led to increased demand for acetonitrile in the Asia Pacific region. This, in turn, is fueling the growth of the Asia Pacific acetonitrile market. In addition, continuous R&D activities being carried out in the region for the development of new medicines and pesticides are also fueling the growth of the Asia Pacific acetonitrile market. The growth of the acetonitrile market is due to flourishing pharmaceutical industry across the globe, which is the major consumer of acetonitrile. Acetonitrile is also used in agrochemicals for synthesizing vitamins and pesticides. It is used to carry out extraction of fluids from fatty acids. In the petrochemical industry, acetonitrile is used as an extractive distillation solvent. However, a limited number of direct production facilities of acetonitrile across the globe acts as a restraint to the growth of the acetonitrile market. INEOS AG (Switzerland), Asahi Kasei Corporation (Japan), Nova Molecular Technologies (US), Formosa Plastics Corporation (Taiwan), Avantor Performance Materials LLC (US), and Imperial Chemical Corporation (Taiwan) are some of the leading companies operating in the acetonitrile market. 10.5 Nova Molecular Technologies, Inc.
10.9 Qingdao Shida Chemical Co., Ltd.
10.10 Nantong Acetic Acid Chemical Co., Ltd.
10.13.1 Concord Technology (Tianjin) Co., Ltd.
10.13.5 Jilin Provincial Chemicals Import & Export Co., Ltd.
10.13.10 Zibo Luzhong Chemical and Light Industry Co., Ltd.
10.13.12 Standard Reagents Pvt. Ltd.